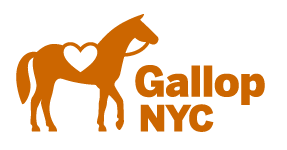 Take your volunteer experience to the next level with GallopNYC's Horse 101, the first workshop of part our new continuing education series for volunteers. Horse 101 will teach you everything you wanted to know about horse behavior, and the fundamentals of Chris Irwin's method of horsemanship. Chris Irwin, a world-renowned horseman, is a a member of GallopNYC's Council of Advisors. Horse 101 is designed to teach volunteers how to keep our horses happy, healthy, and well behaved. You will learn about what motivates a horse, how horses respond to our body language, and what causes horse stress, as well as best practices in horse handling. Did you know that most horse behavior problems are a reaction to man-made stress in their lives? We will teach you how to use your body position to communicate with our horses and elicit a desired response. Horse 101 will be taught monthly, often in each of our locations. Sign up today! Volunteers play a very important role in our therapeutic riding lessons. In fact, we can't have lessons without you. Have you ever wondered how you can better help our riders while you are side walking with them? Well, we are going to show you how! GallopNYC is taking your volunteer experience to the next level with TR 101, the first workshop of part of our new continuing education series for volunteers. TR 101 is designed to teach volunteers techniques in side walking. We will teach you the best ways communicate with riders during lessons, how to give prompts, how to properly fit helmets and so much more. We will show you the best way to support the riders during lessons, allowing you to make a bigger impact on the lives of New Yorkers with disabilities. Like Horse 101, TR 101 will be taught monthly, often in each of our locations. Sign up today!